First of the canon, the C minor blueprints the genre. 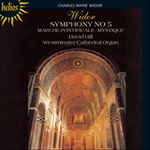 Less a prescribed symphony, more a tonally diverse suite—‘a collection of fantasy pieces, most often without ties between them’ ran Widor’s definition of the latter (1923)—where set-numbers, mood tableaux and contrapuntal routs become cumulatively more important than (and even deny) sonata principle: ‘symphony’ in the sense of an antique ‘concord of sound’. The work divides into seven movements, linked pivotally through the various notes of the root triad (C, E flat, G): Prélude, Allegretto (A flat major), Intermezzo (G minor), Adagio (E flat major), Marche pontificale (C major), Méditation (E flat minor), Finale (C minor). 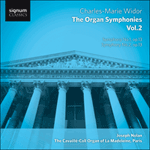 The muscular, tactile style of Widor’s writing is apparent from the onset, the forte moderato quaver subject, slurred/staccato, announced on pedals, the manuals entering to forge a gritty, harmonically intensified trialogue—which tensions are then pursued in the second movement. The Schumann of chords clarified down to staccato semiquavers between the hands, and of boldly proclaimed dotted rhythms, is never far away in the third and fifth movements, the grandiose rondo fifth (paraphrased two years later in Lemmens’s First Organ Sonata) in the spirit of both Gounod’s 1869 Marche pontificale, dedicated to Pius IX, and the ceremonious processionals Widor used to accompany regularly during high feast days at Saint-Sulpice. Compound metres inform the fourth and six movements—a 9/8 chorale (including an unexpected D major semitone drop, cf the sidestepping of the second movement) and a 6/8 barcarolle cadencing in the major. In the closing four-part fugue, the Mendelssohnian cut of the Prélude is replaced by one of tougher stance and chromaticism: the dynamic and grammar may be baroque/classical—the final two bars are pure Bach—but the speech is avowedly 1870 Liszt/Wagner—Widor’s heroes. The leonine six-bar subject, fff, spans a minor tenth. All twelve semitones of the scale are spelt out. And, five pages on, affirming point d’orgue notwithstanding, there is no Picardy third to appease the emotions, triumph the moment, or relent the debate. Tough music for serious minds.